RESPINA is clinically demonstrated in a randomized, controlled clinical study for microdisectomy1. Amniox was honored at North American Spine Society (NASS) 2017, with the Best New Spine Technology award in the category of Biologics and Biomaterials. Leading spine surgeons and industry investors chose Amniox and RESPINA. Based on companies who have created the most innovative, enduring and practical products in 2017 to treat back care. *The techniques presented in this case study are for informational purposes only. Each surgeon must evaluate the appropriateness of the techniques based on his or her own medical training and expertise. Many variables including patient pathology, anatomy, and surgical techniques may influence procedural outcomes. While these clinical experiences are valid, the results are not necessarily typical, indicative or representative of all procedures in which TissueTech’s products are utilized. TissueTech’s product line has been used successfully in many patients by physicians of varying specialties during a variety of medical procedures, and complications, reactions, and/or adverse events are possible with any medical intervention. It is not possible to predict or warrant specific results, nor is it possible to guarantee patient and/or clinician satisfaction. 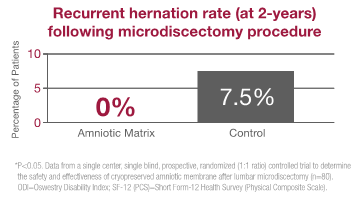 In a two-year, randomized controlled clinical study measuring surgical outcomes following lumbar microdiscetomy, patients treated with amniotic matrix experienced significantly superior clinical outcomes and a lower rate of recurrent herniation. To learn more, download a copy of the above referenced randomized controlled clinical study published in Clinical Spine Research Cryopreserved Amniotic Membrane Improves Clinical Outcomes Following Microdiscectomy, click here. CLARIX FLO® can be used for spine as well. Find out how.